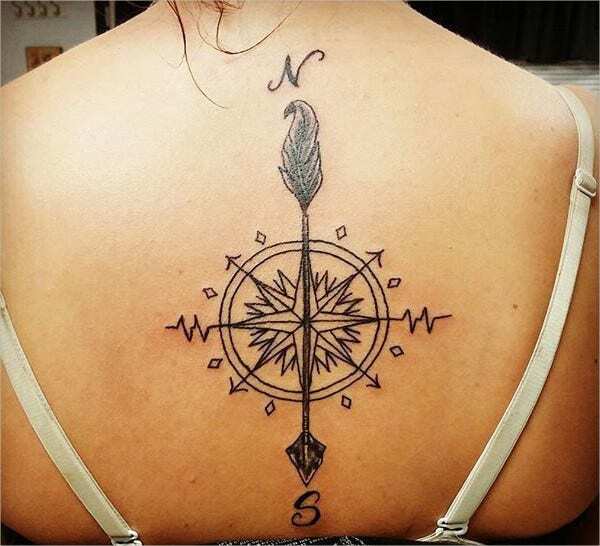 Are you planning to get inked and looking for some ideas? 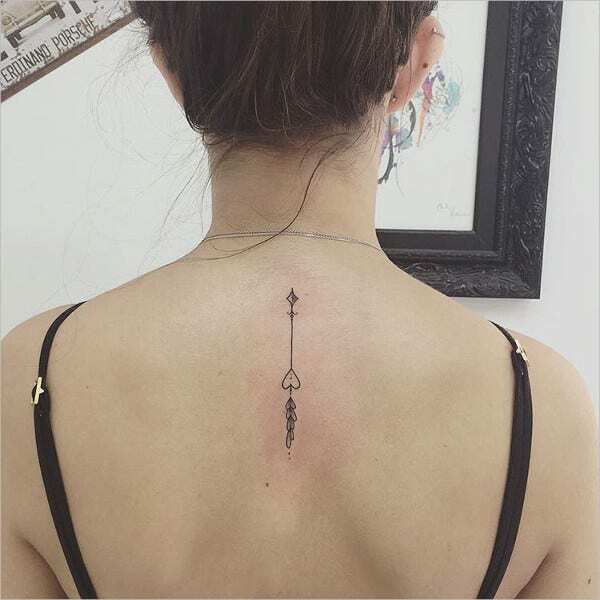 Well, arrow tattoos are some of the most trending tattoos at the present moment and you can have them anywhere in your body- be it your arm or your back or your nape and so on. Arrows signify strength and might and hence would be great if you are looking for something that speaks of a powerful aura. 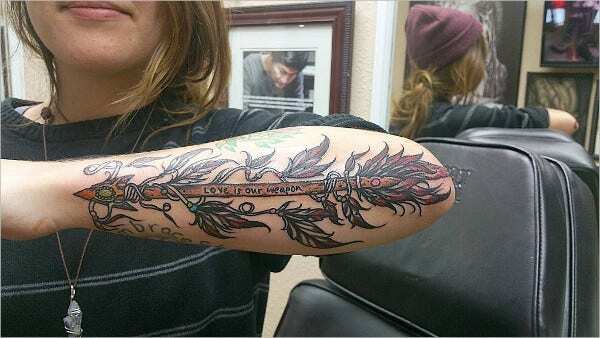 However, you will also find arrow Tattoo Designs with floral highlights that speak of a map to happiness. 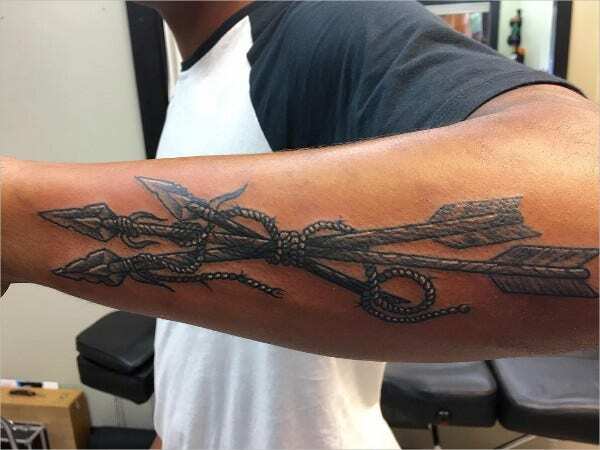 Sharply edged arrows tied together with a rope emit the feel of a warrior and it would be great if you are never afraid to fight of the myriad challenges thrown by life at you. 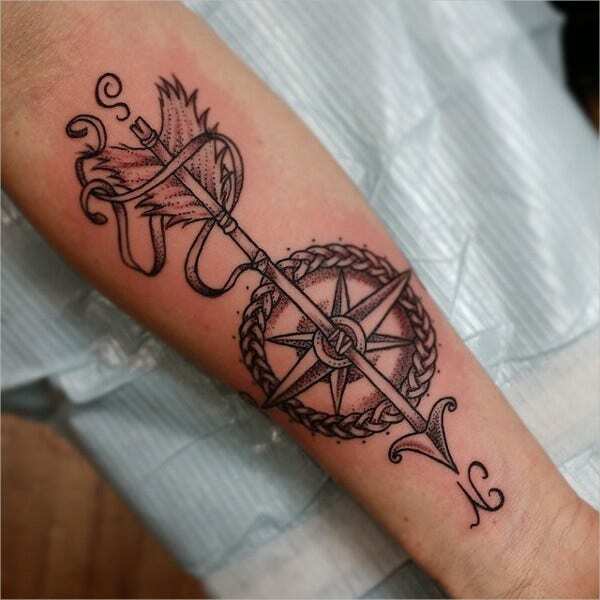 If you are looking for Fine Art Tattoo Designs, this compass arrow tattoo would be a wonderful thing. 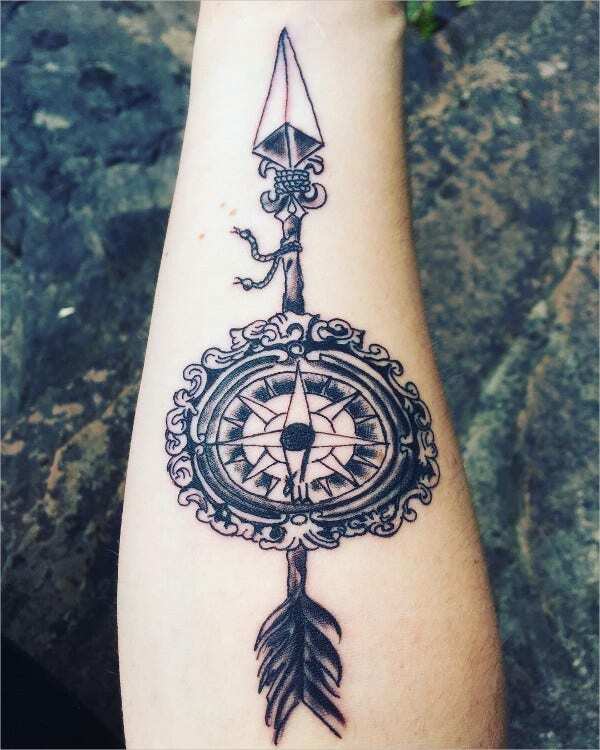 From the detailed shading on the arrow to the braided compass- everything is just phenomenal with the tattoo. 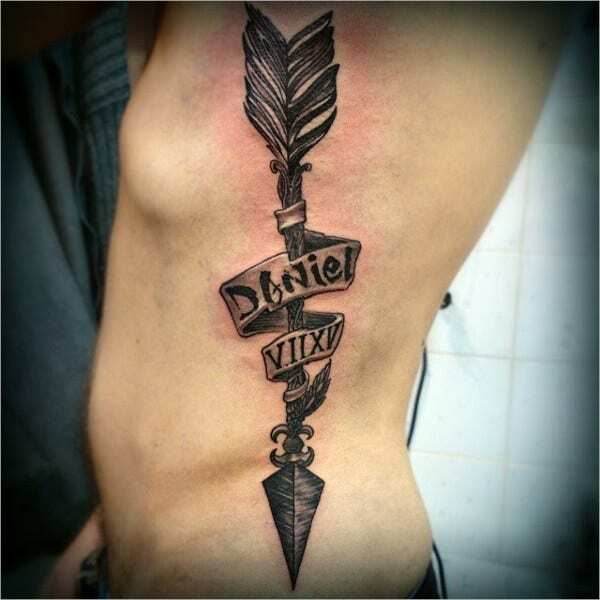 If you are looking for arrow tattoos with a dramatic twist, this arrow-compass tattoo is sure to make your day. The embellished border of the compass is quite a treat. You have a dynamic bow and arrow here with the path and aim of the arrow defined by geometric lines. The intricate shading on the bow reveals the great expertise of the artist. 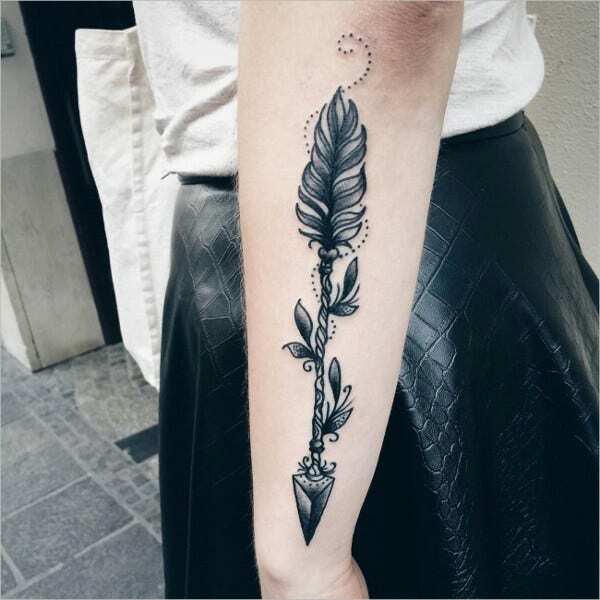 The tattoo here has got everything- from the mighty power of a sharp arrow to the sublime magic of moon to the beauty of a lovely floral bunch- it’s a wonderful all-in-one artwork. 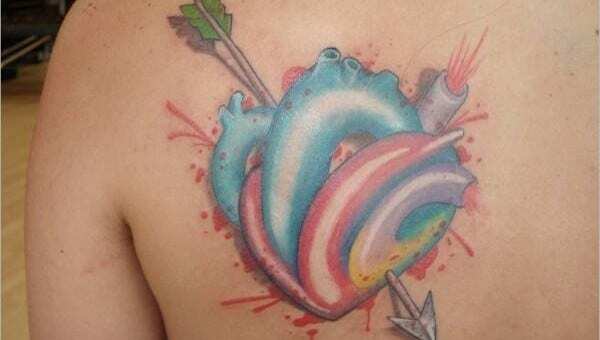 If you are bored of typical black tattoos and want to have some splash of color in your life, this vibrant arrow tattoo in pink and blue is all that you need now. 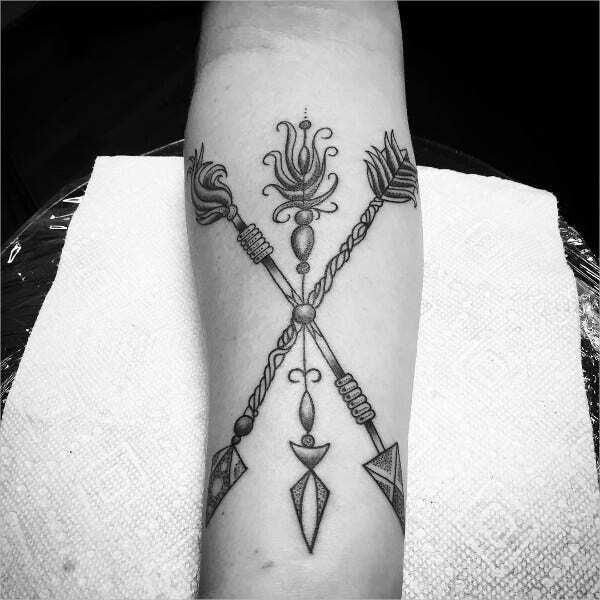 If you are looking for Abstract Tattoos, this arrow tattoo flanked by two spears on two sides would mean a nice artwork for you. The artist deserves much kudos for his detailed attention. 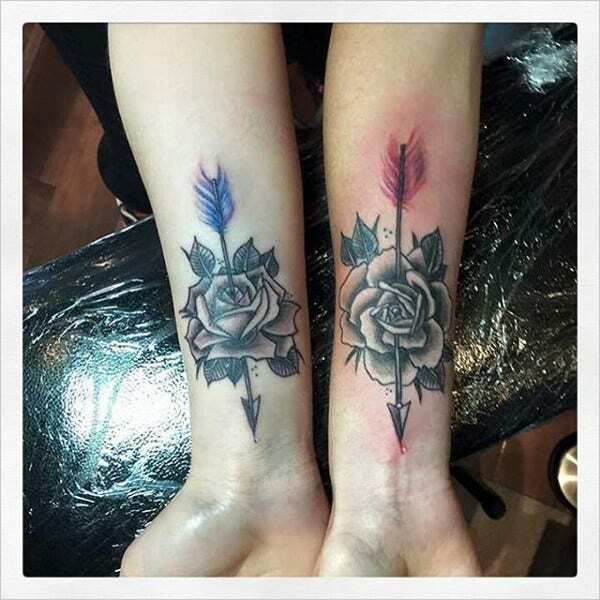 Rose tattoos are no doubt lovely but if you are looking to add some enigma to a rose artwork, an arrow piercing right through a rose like this one is sure to be a head-turner. 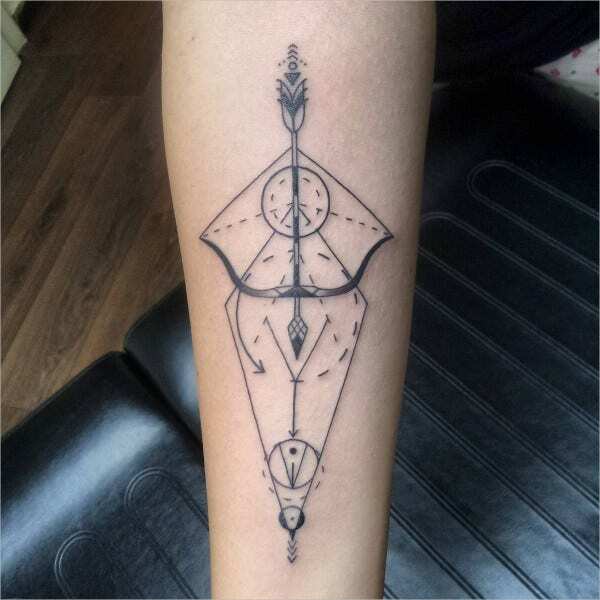 If you are looking for a minimalist yet elegant aura with an arrow tattoo, this arrow tattoo with a fine line would be great. The tiny heart below oozes the romantic spirit of a love arrow. 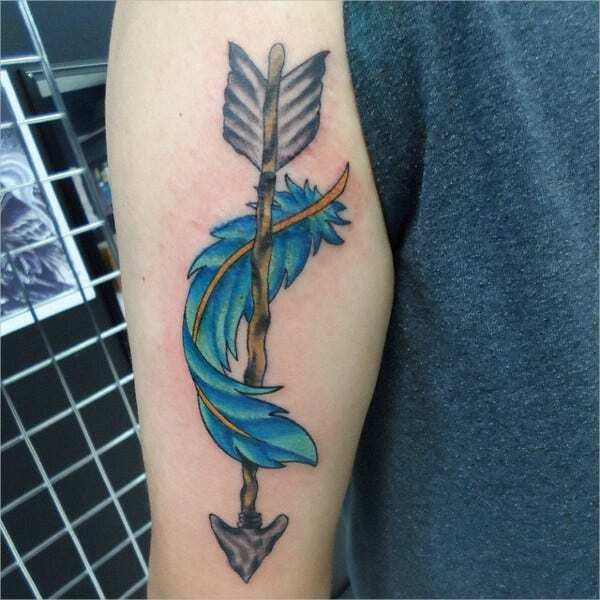 With the back of the arrow beautifully turned into a feather and floral snippets all around, this arrow tattoo speaks of love and happiness and not war- what a refreshing change! 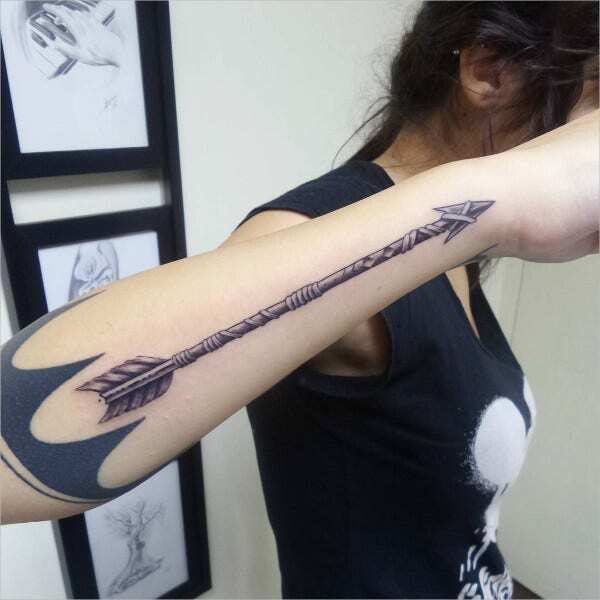 If you are looking for powerful 3D Art Tattoo Designs, this arrow tattoo with its realistic name tag is sure to impress you. It has got a vintage feel around it. 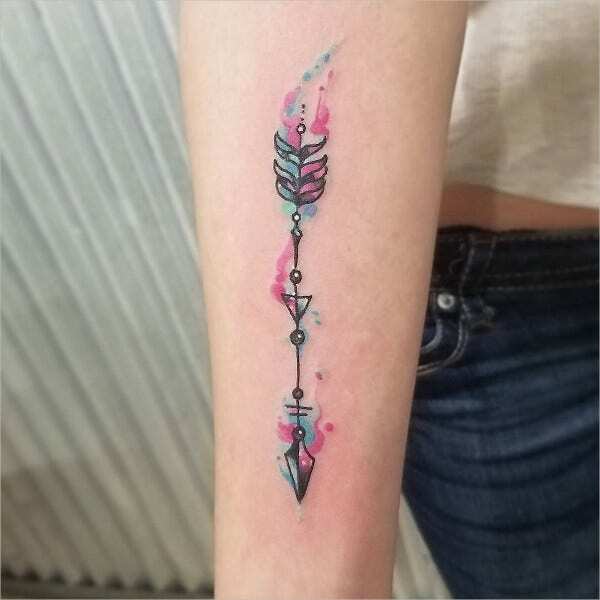 If you have enough love to give, you do not need any power to win and this arrow tattoo is all about that with its tender and vibrant red floral accents all over and the lovely message on the arrow stick. 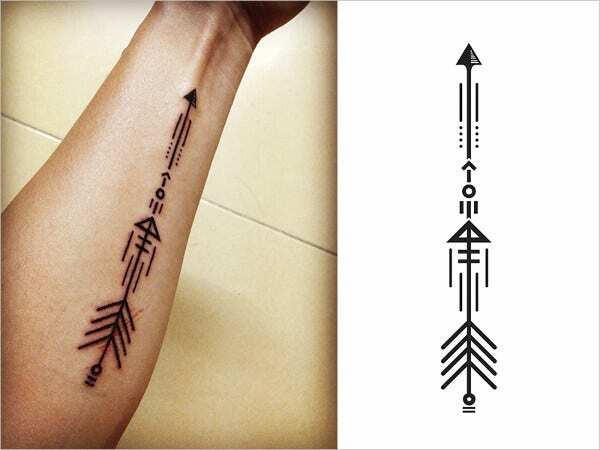 This arrow tattoo has come up with an Aztec feel with its indigenous strokes and lines and it would be great when you are looking for some tribal touch for your tattoo work. The arrow centered by a compass is a brilliant work of art and you will love the dainty feather at the back of the arrow. 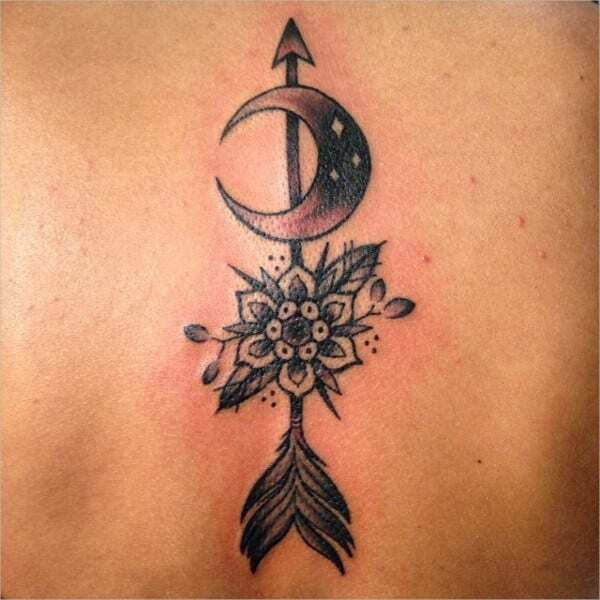 This tattoo would be nice for a wider area like your back. 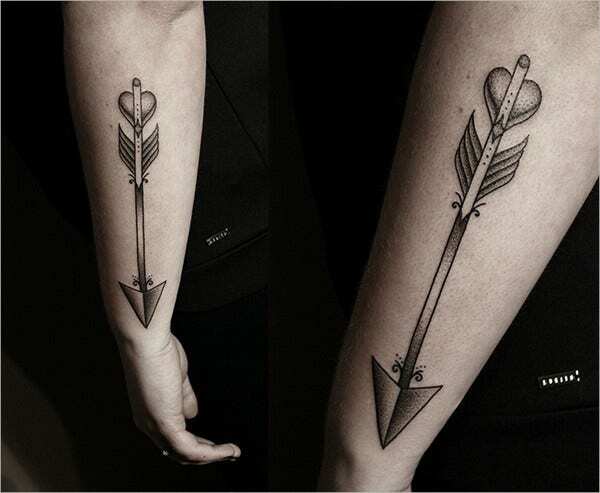 If you are looking for arrow tattoos, the tattoo templates above are sure to make your day better. 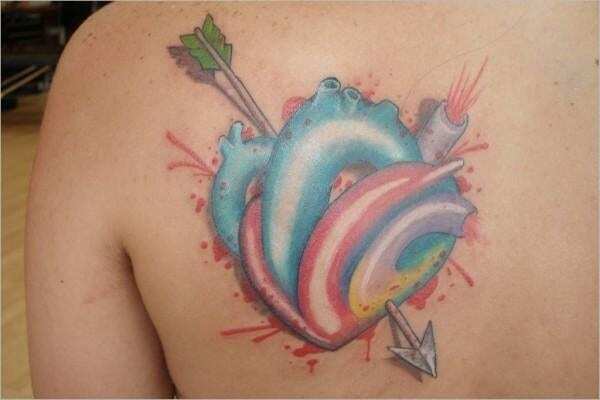 From plain black arrows to colored arrows to arrows with compass to romantic arrow with tiny heart- you have every kind of arrow tattoo over here.